Video of The Handshake Teacher went viral last month. The inspiring video of Barry White Jr., a Teacher at Ashley Park PreK-8 School in North Carolina, shows his ritual of performing an elaborate individualised secret handshake with each pupil as they enter his class in the morning. Besides looking like great exercise and a lot of fun for everyone, there is a deeper meaning to this ritual, Mr. White says it’s about, ‘building a classroom community and making every member feel valued’. Before students will truly participate in the learning community, that is their class, they have to ‘buy into that community’, White states. This handshake ritual as a personal connection, recognition of individuality and just straight up fun, is a means to have the students ‘buy into’ his learning community, and it works. With Virtual Learning Environments (VLE) and collaborative online learning communities becoming more and more a part of student’s learning experience, this video got me thinking - What things can be done to have students’ ‘buy into’ the virtual learning community, to be excited to show up and participate there? I sat down and brainstormed with some educators and we came up with some broad philosophical principles and simple practices which can be practiced to help generate a sense of belongingness in the students and build a stronger, positive online learning environment where all students feel welcome and engage in meaningful learning. It makes sense that students like all people want their individuality recognised and celebrated. Everyone should have the opportunity to stand out from the crowd, have their accomplishments recognised or be made aware that their ideas are heard and prized. Encourage questions, comments and sharing of resources by students. Especially highlight and praise meaningful connections. In literature circles, one of the roles is often “The connector” whose job it is to connect the passage of text to either themselves, the world or to another text (text to self, text to world, text to text). Think of extending this role and practice to whatever material you are discussing in the class and promoting or even assigning a role to individuals to make and share these connections on the VLE news feed. 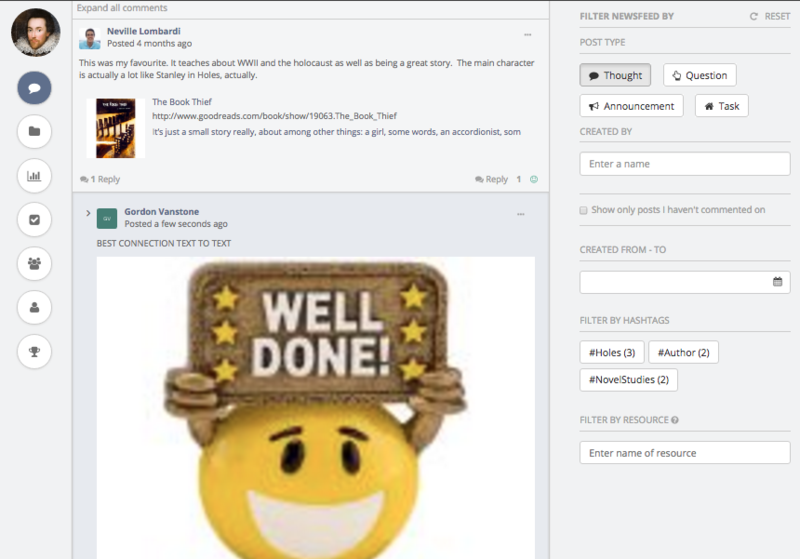 Maybe make it a practice to award a best question, comment, insight or shared resource on the platform each week. This could be done by following the post with the award title and an image which designates the award. Holding competitions and assigning rewards in creative ways furthers engagement and is a way to extend the gamification element of the platform. Create a culture where individual expression or student initiated action is prized and rewarded. If students are sharing; personal projects such as Stories, songs, poems, or short stories, evidence of student initiated action, YouTube videos they’ve made, out of school experiences which connect to the theme and content of class etc. then you have created this culture and are fostering the attitudes of lifelong learners, so congratulations! It should not be an entity in and of itself but be a bridge and connection to the interactions and activities that take place in the classroom on a day to day basis. The VLE should strengthen and support the physical classroom community. Many classrooms have classroom roles or jobs assigned which rotate on a regular basis. This has long been a strategy of teachers to get students to have some ownership in their classroom and learning environment. Why not have some rotating classroom roles or jobs which are specific to the VLE? For example the IB program has various learner profiles and in the PYP learner attitudes we look to catch students exhibiting. The VLE is the perfect place to gather and share evidence of these attitudes in action. Having a student role or job to be to capture (using smartphone or class ipad) other students exhibiting the attitudes and sharing these pictures or videos online is a great way to build a community while also gathering evidence of the attitudes in action. Killing two birds with one stone, now that’s being a Thinker! Discussion, both in class and online, allows students to learn and practice discourse. The VLE extends the time and makes available the resources to create blended learning environments, this coupled with utilizing social media style communication modes gives students the opportunity to develop their understanding together, outside of school, using flexible pacing. But just because this opportunity exists doesn’t mean it will happen naturally. Teachers need to nurture a collaborative and communicative online learning community. Modeling is very important when initiating a VLE or online learning environment. The teacher should be sharing often; thoughts, questions and resources so that students get constant reinforcement of the importance of this practice and a structure to follow of how to properly do it. Sometimes it will be necessary to structure a discussion or even a lively debate. 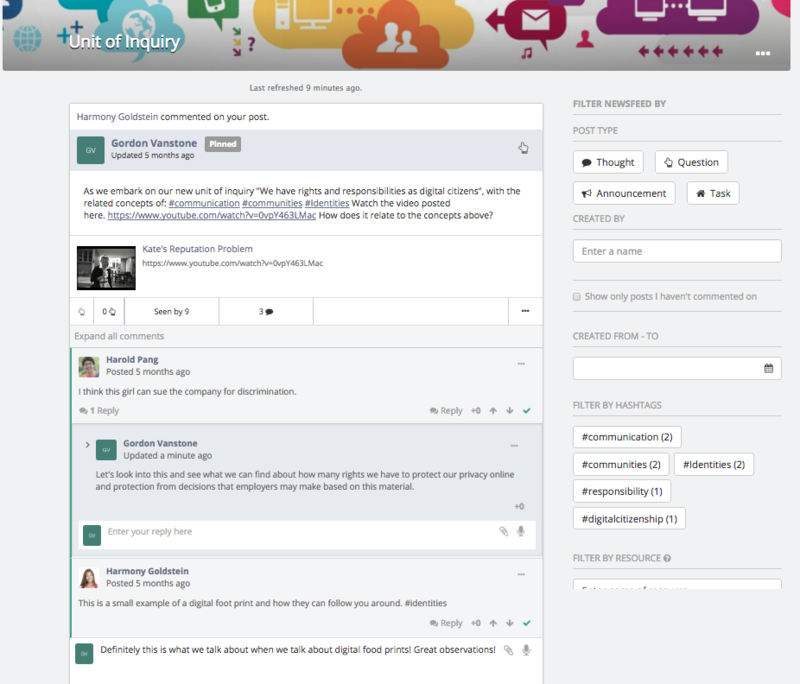 Assign sides and positions and have the whole debate unfold on the news feed or social tool of your learning management system. Provide anecdotal feedback and observations of both in class and online behavior and work. By using a low pressure, nongraded approach, students can focus on the descriptive nature of feedback. Building in time and structures to adequately assess, forms an atmosphere where understanding is emphasized. As thoughtful practitioners, teachers can help students become successful lifelong learners. It is very important to implement supportive practices. Constant feedback of the positive variety will sustain a student’s interest and participation in the online learning community. Most of the feedback students get from teachers on their work comes from in class, informal conversations; why not replicate this same informal discussion as a form of feedback in your VLE. Highlight the work and creative endeavors of the students. Some schools showcase student artwork or student photographs on their custom branded Login pages for Teamie. 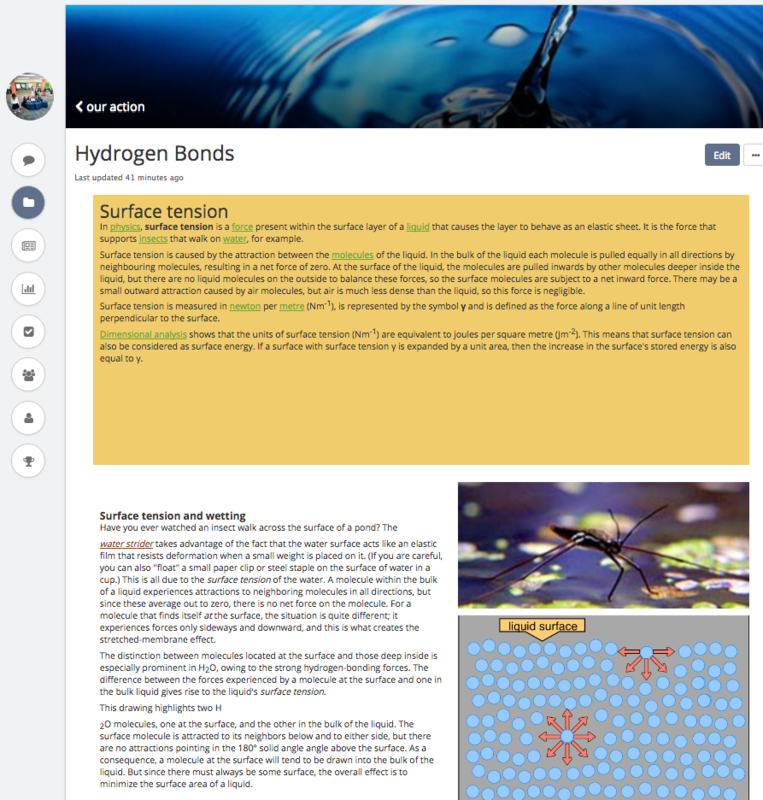 In individual classes teachers can draw attention to particularly well written or exemplary reflections, stories or student projects by linking or displaying on the news feed. This showcasing of student learning makes students feel they are valued members of the learning community. Let’s not forget that at the heart of Mr. White’s handshake ritual and all the deeper meaning that can be assigned to it, it is meant to be fun. “It brings a little joy to their day” White surmises of the ritual. This should be a goal of our VLE as well. Make it a fun place where students enjoy going, enjoy spending time and enjoy learning. Have ongoing rituals or practices which students will tune in for. i.e. weekly trivia, picture of the week, guess who game etc. 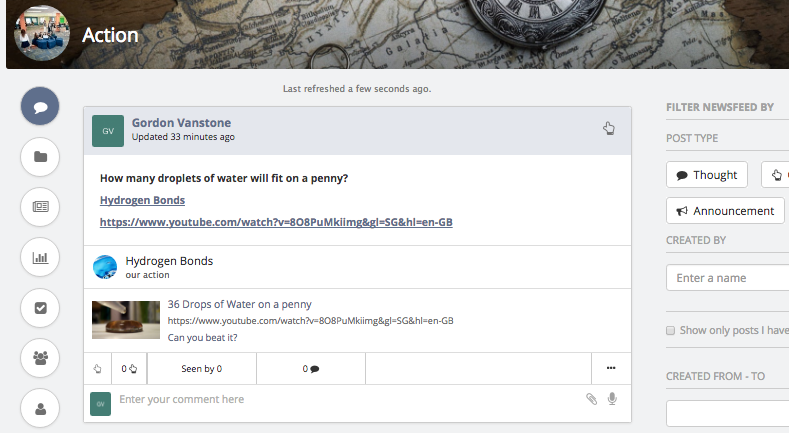 This news feed post introduces a 'discrepant event' , by asking students how many water droplets will fit on a penny. When they watch the video they will have a big “ooooh, aaaah” moment seeing just how many droplets can fit. This hook motivates students to want to learn about the laws of nature demonstrated in the video which conflicted with their common beliefs, the linked lesson to the post leads them to the core learning in the following lesson. The goal is to get students to buy into the online learning environment just like we need them to subscribe to our physical class. This buy in is generally articulated and displayed by joyful participation and engagement, students responding to information, seeking instructors’ feedback, reflecting on the feedback, and acting to appropriately tailored personal learning experience. If we are able to create an online learning community that prizes the individual, offers meaningful collaboration, discussion and feedback and is a fun, safe and enjoyable space, then we will get the requisite buy in from our students. This engagement and active participation in any learning environment is the key ingredient to being able to both teach the material and more importantly, foster the attributes of a life long learner. Ultimately, authentic enthusiasm rubs off. Any environment in which we engage with students it is important to be invested, be present and be passionate.